COUNSELORS – Trained counselors are eager to offer you biblical help. Please access the counselor directory. CONFERENCES – IABC offers biblical counselor training conferences on both the national level and the local level. We would love to see and meet you at a training conference near you. Please contact us for further information. REVIEWED BOOKS – Firmly standing on God’s super-sufficient and authoritative Word, we offer the following review of a few helpful books that can grow you in counseling and discipleship. Where should Christians go to heal the deep hurts in their hearts? Today's search for inner fulfillment has exploded into the Recovery movement, complete with twelve-step seminars, counseling programs, and self-help books. 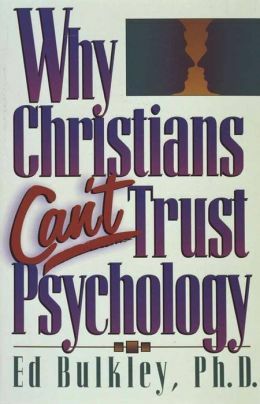 Thousands are looking to Christian psychology to help them attain victory over modern dysfunctions. Does that mean the Bible alone is no longer adequate for the problems faced by Christians today? Some say we need the Bible plus psychology. Others say the Bible alone is sufficient. With deep insight and candor, pastoral counselor Ed Bulkley presents the opposing sides of this issue--and offers trustworthy, biblical answers for those who long to break away from pain and guilt and know true freedom...genuine inner peace...and a fresh beginning. The pressures to find the solutions to human hurt and suffering have never been greater. Clear answers are urgently needed for the hurting--today. Available through IABC at (303) 469-4222, where you may order using Visa/MasterCard. Many Christians today genuinely desire to overcome hurts that stem from past experiences. They want to be rid of their depression, insecurity, fear of failure, or unhappiness. They want to be free of the pain of mental or sexual abuse. Yet oftentimes, therapists and counselors say that before we can know healing, we must go back into our past to recall repressed memories and “work through the pain.” That, however, is not God’s way of freedom from the deep hurts of life. His way offers immediate hope and genuine peace—not lingering doubts about an unchangeable past. No matter what the condition of the wold around us, God has already given His children everything they need for a joyful, power-filled walk with Him. In rediscovering an honest faith- a faith that really works- you'll find a whole new way of facing life's challenges with trust and confidence in your heavenly Father. How big is your God? Big enough to be the all-wise, all-powerful Creator of the universe. And big enough to meet all of your needs, no matter how great or small. THERE IS HOPE FOR EVERY MARRIAGE... Even in the aftermath of sexual sin. Jeff Colón's marriage stands as a testimony of God's power to restore any marriage, even one that has been ravaged by sexual sin and drug addiction. Christian marriages are under attack as never before. Couples are suffering more than ever under the same despair that gripped Jeff and his wife, Rose -- Is there really hope for my marriage? THE ANSWER IS A RESOUNDING YES! ...but the solution wasn't the typical fare found in Christian marriage books. Jeff and Rose had to go to the heart of the problem.... they needed something more than outward alterations; they needed an inner transformation. Jeff's personal journey and his experience counseling men and couples qualifies him to share the biblical truths that will restore any marriage "From Ashes to Beauty!" Available for purchase now on Amazon! This booklet is a great resource to give to your counselees. It will explain the process of Biblical transformation as they learn to change their thought patterns. Available through IABC at (303) 469-4222, where you may order using Visa/MasterCard. The Love of God in Biblical Counseling is far from being just another book about the love of God or biblical counseling. It shatters preconceived ideas and reaches to the very core of who we are in Christ. It addresses much more than techniques and methodologies as it shows the vital role that our participation in the very nature and love of God makes in our life and in the lives of others. In this book Marlowe Bulkley (pastor's wife, mother, and grandmother) shares some of her experiences to motivate you to search for yourself how you will travel through your own menopausal adventure. She challenges you, even during what can be a difficult time, to determine how you will remain a Godly woman, still available for God to use in spite of the inevitable changes that are coming. This book is full of Scripture references that will help you to focus on the Word of God, giving you an eternal perspective during these challenging times. Available through IABC at (303) 469-4222, where you may order using Visa/MasterCard. Counselor training videos and National Bible Conference recordings are now available through IABC. For more information or to order email information@iabc.net or call (303) 469-IABC (4222).